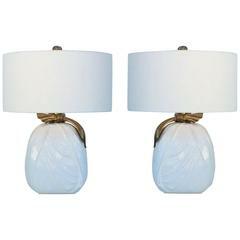 A very chic vintage pair of glamorous American Hollywood Regency table lamps. 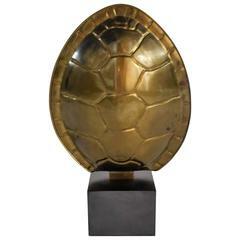 Exquisite high quality of execution in handcrafted shiny gold heavy solid brass, the streamline organic shape is elegantly decorated with an Art Deco style cast decor in relief on the front and also on the back, raised on an arched base. Fitted with threaded shades. All Chapman finishes are softened and finished by hand to achieve a subtle character. Hand craftsmanship is emphasized in all Chapman designs that are executed in relatively limited editions to provide a sense of uniqueness to their styles. 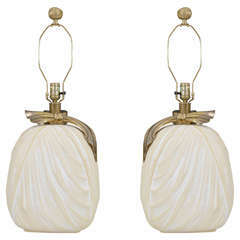 Dimensions of body: 31.5 in H x 14 in W x 6 in D.
Offered is a fabulous, pair of 1980s Hollywood Regency Chapman lamps in the shape of draped bows. The base is ceramic, knotted bow is brass. Includes original labels. 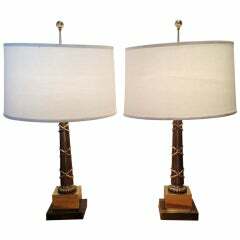 A pair of all brass Chapman table lamps. 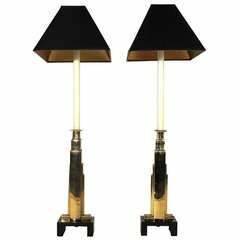 Late 20th century table lamp made of cast brass rope and tassels, and mounted on a black marble platform base. 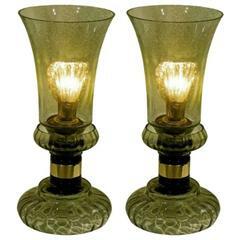 Made by Chapman in the Hollywood Regency style.